The internet can get you into a whole load of trouble. It can put ideas in your head. Dangerous ideas. Like deep-frying a whole turkey. I first stumbled across this novel way of cooking a while ago, whilst scanning YouTube for outlandish food experiments. And it looked amazing. The theatre and spectacle of plunging a huge brined bird, into a bowl of seething gold, in someone’s backyard in small town US of A at Thanksgiving; well, that seemed hard to beat. Then I stumbled across the warning videos. The ones that showed where this type of cooking can go horribly wrong. Showing what happens to turkeys that have not been duly drained of their salting liquor before making that descent. Boom! You get huge explosions. Water and boiling oil does not mix you see. The subsequent drop of the camcorder and high pitched scream of ‘Oh ma Gaad, Cletus! Are y'all OK?’ will haunt me forever still. But like a moth to a flame, I’ve always fancied returning to the idea and when I saw that one of my peers, a rather good baker who resides in Holland, had been getting up to the same tricks with chicken, I felt that I still had to give this method a crack. With safety in mind though, I decided to scale things down further and pitch my first attempt at ‘whole bird’ deep-frying by using poussin. Poussin that had been brined overnight in buttermilk. Given that this young bird provides a delicate and light meat anyway, you may be wondering why I went through the extra rigmarole. But brining does still add an extra dimension prior to cooking. You see, by curious osmosis, the whole process is about manipulating proteins by fattening them up and breaking them down a touch before the real cooking gets under way. The reason why some meat, poultry in particular, often comes out dry, is down to that fast shock of initial heat, and this is because the water in the proteins comes flying out, leaving them dense and tight. Having just read that last sentence back to myself, I do realise that this is not a very science-sy way of explaining things but simply put, brining ensures that everything stays nice and juicy. Anyhow, that was my reason for marinating the poussin in an acidic bath overnight and I am sticking by it. You could source ‘buttermilk’ by the way, but after strenuous research (i.e. asking Twitter) skimmed milk mixed with lemon juice or vinegar also does the trick. The biggest leap of faith comes to the actual frying and if you own a proper deep-fryer, it is probably best to use that but it might not be big enough. I went down the route of using my beloved deep stock pot, called Barry White, and accomplished a very good result. The poussin was lovely and crisp on the outside but still supremely succulent inside. It left me very happy. Yes, it’s awesome what you can achieve with a steady hand, nerves of steel and a taped off kitchen. Next time, I think I may even invite my wife in to film me. 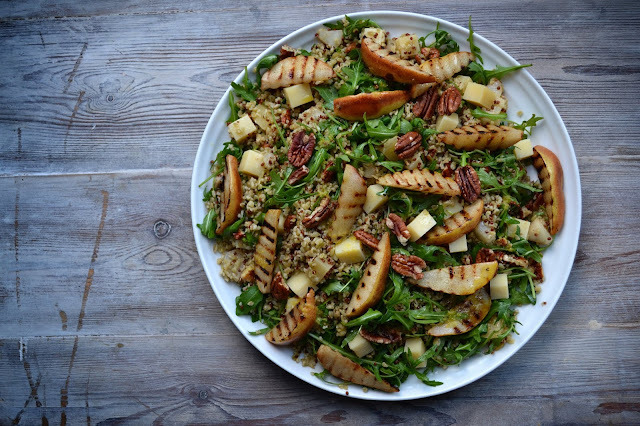 This recipe post first appeared on Great British Chefs. To begin, make the buttermilk brine by combining the skimmed milk with the lemon juice and salt into a bowl and whisk together for 5 minutes. The milk will curdle but that is fine – the main point here is to incorporate the salt. Place your poussin in the bowl, cover with cling film and place in the fridge. The minimum time to marinate or brine your poussin would be 4 hours but it is good to leave overnight. Return every now and then to turn the poussin over. When ready to start cooking, preheat the oven to 200°C/gas mark 6. Place a large saucepan of water on the hob to bring to the boil. Once boiling, add the potato wedges and simmer for just 5 minutes, then pour into a colander in the sink and leave the potatoes to steam for another 5 minutes. 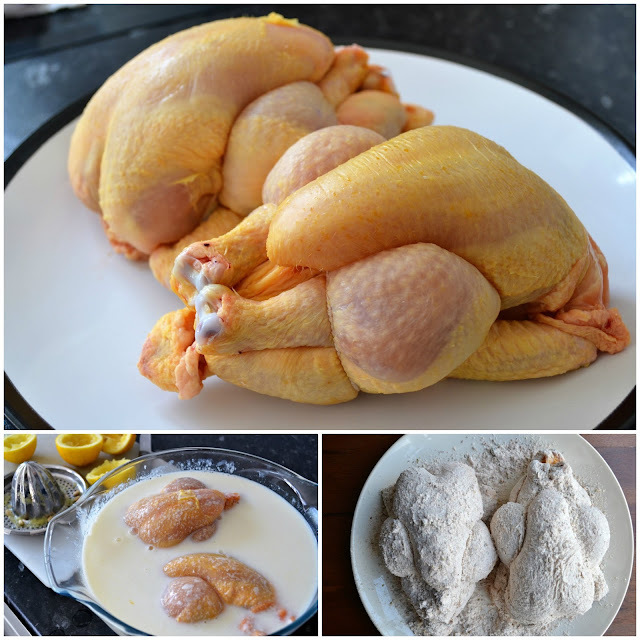 Take the poussin out of the buttermilk brine and stand them upright (cavity facing down) in a sieve or colander over a bowl and leave to drain. Meanwhile, take a large roasting tray, add the rapeseed oil and pour in the wedges. Toss around to get a good even coating, add a touch of salt and pepper over the top and place in the oven. Check on them every 15 minutes or so to shake and move about. All in all, the wedges will take 45 minutes. 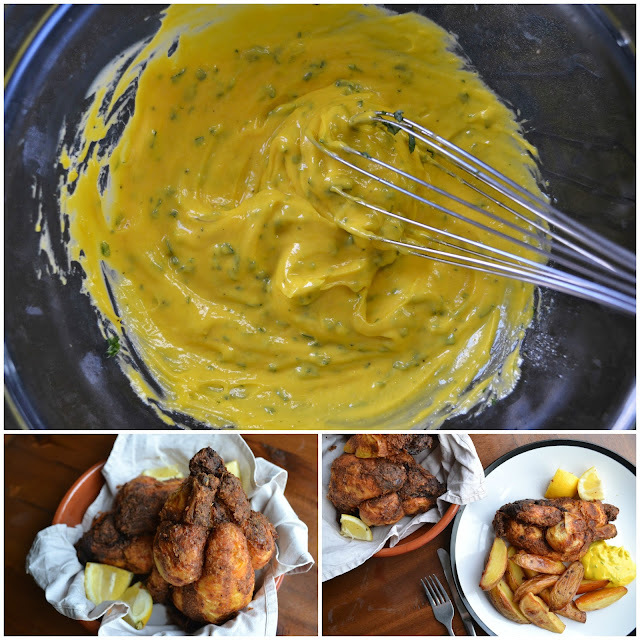 To make the tarragon mayonnaise, place a small bowl on top of a wet kitchen towel or tea towel (this is to stabilise the bowl) and add the yolk and mustard. Whisk together until everything becomes creamy then very slowly drizzle in the oil, whisking all the while. Keep going until everything starts to thicken and emulsify until all the oil is gone. Add the chopped tarragon and a squeeze of lemon juice, folding everything in with a spoon. Season to taste, cover with cling film and leave in the fridge. To coat the poussin for frying, combine all the dry ingredients in one bowl and crack the eggs in another bowl, beating lightly to combine. Roll the poussin around in the egg wash so that it gets a light coating and then dump them in the flour bowl, again, ensuring they get an even coating all round. Set aside on a plate so they are good to go. 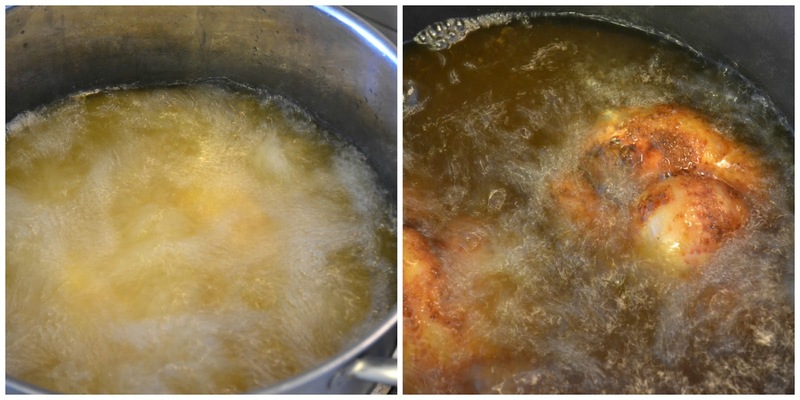 If using a fryer, heat the oil to 180°C. If you are using a stock pot, like I do, pour in the sunflower oil and place over a high heat on the hob, using your biggest burner. Keep an eye on proceedings by using a temperature probe, waiting until it reaches 180°C. When ready, carefully drop both poussin into the oil and deep-fry for 15–20 mins, turning the poussin around occasionally. To make sure that they are cooked through, use that temperature probe and take a reading from the thigh – it needs to have an internal temperature between 72°C–75°C – if it’s not quite there you may need to pop them back into the pot. Before serving, place both the poussin and wedges on kitchen paper to remove excess oil, then slice each poussin straight down the middle with a sharp knife. Set each half on a plate with a generous scoop of wedges by the side and finish with an equally lavish blob of tarragon mayonnaise, straight from the fridge.